The 300-boat entry limit was reached quickly, attracting boats from a wide spread of nations. The bulk came from the UK and France, but there were potent entries from the USA, Hong Kong, Ireland, Germany, Belgium and the Netherlands and others coming from afar afield as Chile and Australia. Light winds at the start and end, combined with powerful spring tides, made for a tactically challenging race, and one of the longest in recent years. Niklas Zennström's Ran 2 won the Fastnet Trophy for the best corrected time under IRC, completing the course in 63 hours, 1 minute and 33 seconds. While the previous Rolex Fastnet Race is remembered for the course record time being demolished, the only record broken in this year's running of the Royal Ocean Racing Club's biennial 608 nautical-mile classic was one relating to competitor patience, as light winds at the start and end, combined with powerful spring tides, made for a 'tactically challenging' race, and one of the longest in recent years. Running from Cowes to Plymouth via the Fastnet Rock off southwest Ireland, the race again proved it remains one of the world's most prestigious offshore yacht races. The 300-boat entry limit was reached quickly, attracting boats from a wide spread of nations. The bulk came from the UK and France, but there were potent entries from the USA, Hong Kong, Ireland, Germany, Belgium and the Netherlands and others coming from afar afield as Chile and Australia. This year's event also attracted a hugely competitive line-up of professional sailors and grand prix race boats from around the world. This included the 2007 race record setter, Mike Slade's 100ft supermaxi ICAP Leopard; two recently launched state of the art Mini-Maxis taking a break from the Med circuit: Niklas Zennstrom's Judel-Vrolijk 72, Ran 2, and Patrizio Bertelli's STP 65 Luna Rossa, crewed by his Italian America's Cup team and featuring an all-star cast including five time Olympic medallist and recent Volvo Ocean Race winner, Torben Grael. The Rolex Fastnet Race was also the offshore debut for Karl Kwok's brand new Farr 80, Beau Geste, run by America's Cup helmsman Gavin Brady, while Roger Sturgeon's race-proven Rolex Sydney Hobart-winning STP65 Rosebud/Team DYT had come across from the USA. The IMOCA Open 60s had their own class, including stars from the Vendee Globe singlehanded round the world race such as the UK's Sam Davies on Artemis Ocean Racing, Dee Caffari and Aviva, plus France's Seb Josse on BT IMOCA 60. They were joined by 2005-6 Volvo Ocean Race winner, Mike Sanderson, who was reunited with his Team Pindar. Also in their own class were the swelling fleet of Class 40s, including solo round the world sailor Giovanni Soldini and his all-conquering Telecom Italia, plus Class World Champion Tanguy de LaMotte and Initiatives Saveurs-Novedia Group. Although the doomsayers were forecasting no wind for the start, in the end it could not have turned out better with an easterly wind forcing spinnakers to be hoisted in all eight classes - a magnificent colourful spectacle for competitors and the spectators crowding the Cowes seafront, alike. All was good, with the tide shooting the boats west in the early part of Sunday afternoon. Then the wind shut down at the Western extremity of the Solent, with particular abruptness on the mainland shore. After this first roll of the dice, a new south-westerly breeze filled in gently, but with insufficient strength to power the majority of the fleet past Portland Bill on the first night. Portland Bill was probably the defining moment of the race, with most of the big boats managing to make it past before the tide turned foul. The majority, including some notable professional boats, were forced to set their anchor and kedge, typically for an hour or so, but in some instances for up to six hours, to prevent themselves being ripped back east. Others such as Andrew McIrvine, Commodore of the RORC, aboard Peter Rutter's Quokka VII, plunged south into the Channel to avoid the worst of the tide. "We got to the place where our mobile phones said 'welcome to France'. The met guys said it would feel dreadful and it did feel dreadful. I nearly had a mutiny on board!" While the early stages looked to be favouring the big boats, they by no means had it all their own way. The wind remained on the nose down the Channel, then inconveniently veering northwest causing them to remain upwind while crossing the Celtic Sea towards the Fastnet Rock. ICAP Leopard eventually rounded the Fastnet rock at 00:26 GMT on Tuesday morning and began her return journey. The downwind leg back to Bishop Rock was a tense one for Slade and his supermaxi crew as those chasing were able to close in, benefiting from new breeze arriving from the west. But with a 20ft length advantage over her closest rival, there was nothing to touch Leopard which sauntered home to take her second consecutive line honours win in the Rolex Fastnet Race, even though her course time of 2 days 11 hours 9 minutes and 36 seconds was almost 15 hours more than two years previously. "It was a great race," commented Slade. "We didn't get into any difficult situations. We just wanted to get around fast and competently. All in all we are delighted to be here, second time running, back to back victories in this great race." Behind ICAP Leopard, the IRC Class Super Zero handicap contest between the Mini Maxis was won convincingly by the Tim Powell-led crew aboard Ran 2, ahead of Luna Rossa. It is worth noting that Ran 2 was just beaten home on the water by the first of the smaller IMOCA 60s. Even more remarkable is that Seb Josse was sailing double-handed, demonstrating the performance potential of these water ballasted, canting keel round the world race boats. The IMOCA 60 battle had been a case of 'nip and tuck' for the duration of the race course with Sam Davies and Sidney Gavignet's Artemis Ocean Racing rounding the Fastnet rock first, ahead of BT, Team Pindar, Marc Guillemot's Safran and Aviva. However, once downwind and en route to Bishop Rock, Artemis Ocean Racing was overhauled by BT. "We are not very quick downwind VMGing," explained Sam Davies. "So as soon as it went into a VMG run, they soaked and went low and fast and we were high and slow. Our boat must be 2 tonnes heavier than BT and Sidney's bottle of wine didn't help either!" Just over a day after Leopard's arrival, the Class 40 competition was decided with Tanguy de LaMotte and his Initiatives Saveurs-Novedia Group taking honours in this rapidly expanding class. The French Class 40 was leading by 12 miles at the Fastnet rock, and while race favourite Giovanni Soldini closed in on the run to the Bishop and on to the finish, the Italian was unable to catch LaMotte. Despite arriving on Tuesday, it was not until late on Thursday afternoon that the RORC was able to confirm that the overall IRC prize for the 2009 Rolex Fastnet Race had been won by Niklas Zennstrom's Ran 2. The break made by big fast boats on the first night proved decisive and there was never sufficient wind for the slower boats to make up their time. "It is fantastic, we are very excited about it," commented Zennstrom, the founder of Skype. "One of the key objectives when we were building Ran 2 was to be able to do offshore races and the most obvious race we put on the calendar was the Rolex Fastnet Race. So it is great we have done so well in it." Elsewhere in the IRC fleet, Amanda Hartley and Jamie Olazabal's Spanish La Floresta Del Mar proved that some prudent additions to an otherwise family crew can make all the difference. Their Swan 56 included in its crew 470 Gold medallist Jordi Calafat, now with America's Cup defenders Alinghi and multiple round the world sailor Guillermo Altadill. They ended up claiming IRC Zero honours by almost 1.5 hours from race veteran Piet Vroon and his brand new Ker 46, Tonnerre de Breskens. IRC Class One was taken by the veteran French campaigners on Jean-Claude Nicoleau's Grand Soleil 43 Codiam, skippered by Nicolas Loday. Although Codiam took the lead on the first night, Nicoleau attributed their victory to good tactics in their crossing of the Celtic Sea to the rock. Although also French, the Prime Time team, winners of IRC Class Two on an A-35 could not be more different. Marc Alperovitch and Jerome Huillard are experienced and successful inshore racers having been part of the French Rolex Commodores' Cup team in previous years. This was their first taste of offshore racing. However their meticulous approach to the race and their preparation reaped dividends. With over half the Rolex Fastnet Race fleet berthed in and around Sutton Harbour, in the Barbican area of Plymouth, the prize giving at the Royal Citadel was packed to the rafters. Yet, the principal topic of conversation was the large numbers of boats still at sea, many unlikely to finish until the Sunday; a week after the race had started. As it happened, a freshening breeze has propelled all but seven yachts to the finish. This has been an awkward Rolex Fastnet for competitors rather than difficult. The conditions have been have been frustrating. Yet the experience has been no less rewarding listening to the comments of Nick Haigh, owner of the DK46 Dark & Steamy: "The most glorious moment was reaching back towards Bishop Rock under spinnaker, staysail, full main, eating bacon sandwiches, doing maybe 12-13 knots and being surrounded by dolphins. It was great." What more could you ask for. In his concluding remarks, RORC Commodore, Andrew McIrvine was positive about this year's Rolex Fastnet: "I think it was wonderful. Everyone seems to have enjoyed it. People thought it was a good, hard race. It wasn't too rugged, but it was a very tactical race which made it fun to do." 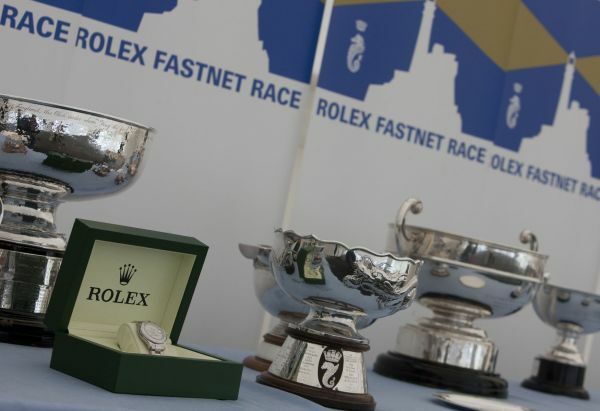 The 2011 Rolex Fastnet Race starts on Sunday 14 August.